KARACHI: Breaking the trend from the previous session, Pakistan Stock Exchange (PSX) ended the day negative. The indices that traded in green in the early hours went downhill as tensions between Indo-Pak escalated. Foreign investors offloaded a net of $0.98 million on Monday. 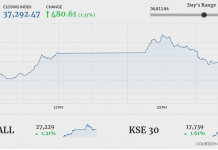 The KSE 100 index benchmark reached its intraday high of 39,955.28 after gathering 205.53 points in the morning session. It then drove in the opposite direction and touched an intraday low of 39,598.91 after losing 150.84 points. The index finally closed lower by 61.24 points at 39,688.51. 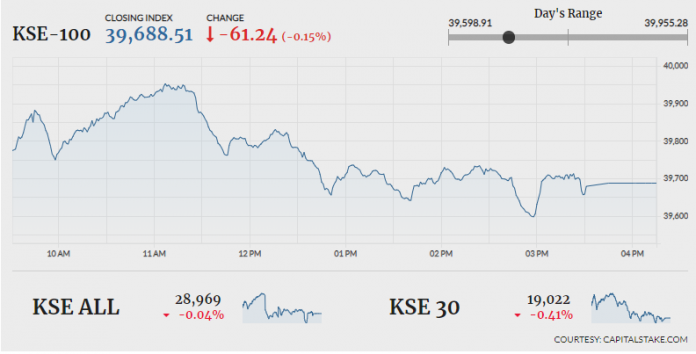 The KMI 30 index declined by 244.02 points to end at 66,183.15, while the KSE All Share index fell short by 12.12 points, settling at 28,969.17. Out of the total traded scripts, 138 advanced, 170 declined while the value of 25 remained unchanged. The overall trading volumes declined from 168.44 million in the previous session to 163.86 million. The Bank of Punjab (BOP 2.03pc) managed to maintain its position as the volume leader with 66.89 million shares exchanging hands, followed by K-Electric Limited (KEL +2.28pc) and Nishat (Chunian) Limited (NCL +2.83pc) with 7.64 million shares and 6.88 million shares swapping hands respectively. According to the latest data released by All Pakistan Cement Manufacturers Association (APCMA), sales of the cement industry declined by 19.05pc in the month of February. The cement despatches were recorded at 3.325 million tonnes in February 2019 as compared to 3.780 million in February 2018. Following the news, the cement sector lost -0.54pc from its cumulative market capitalization. Maple Leaf Cement Factory Limited (MLCF) was down by -1.19pc, Fauji Cement Company Limited (FCCL) by -0.66pc, D G Khan Cement Company Limited (DGKC) by -0.73pc and Lucky Cement Limited (LUCK) by -0.53pc. Chashma Sugar Mills Limited (CHAS -2.27pc) declared its financial results for the year ending 30th September 2018. A final cash dividend of Rs1.50 was also announced by the company. The company’s sales declined by 9pc YoY while, earnings per share improved from Rs3.21 last year to Rs6.75 in the period under review.